Pretty, huh? Okay, I'm not really snowed in, except voluntarily, but there's no way a car is getting anywhere near that house and I have to haul things up to it on a sledge. It got a bit easier after I dug out my old ski pants. 1) the time it snowed a bit during the night and my mother went round all the neighbors' cars and stole what little was left of the stuff so we could make a snowman 20 cm high on the bonnet of her car. 2) skidding around on the occasional plaque of frozen white ice during our summer holidays in the high mountains. 3) that story I read about how it did snow once, and the snow stole all the colors and sounds, and even the heroine's friend, so that she had to go out into the dead emptiness and rescue him. I didn't know it at the time, but the story was probably based on Hans Andersen's Snow Queen, transplanted to the Mediterranean. The story of my first snow experience goes like this. I was about seven or eight when my great-grandfather died back in England, so our mother collected up her two children and some suitcases and went to the funeral. I didn't really know my great-grandfather except as a very old very wrinkled man with some missing fingers, someone I'd seen once or twice. I didn't understand death except as a kind of emptiness - like a missing tooth - I'd had a few of those by then. I'd never been to a funeral before, or to England in the winter, and I'd never seen it snow. I stood by the window of my grandmother's house and watched the sky falling down onto the street outside. After a while my grandmother came and tied bin bags over our shoes and sent us out in it. I wasn't exactly scared but I felt uneasy and I never could decide whether it was fun or not. I still feel pretty much the same way about snow. Skiing on a beautiful sunny day with lots of happy people around you really is fun, though that doesn't alter the fact that snow really can be dangerous*. And neither of those two things has anything to do with the feeling I can never quite shake off that something about snow isn't right. 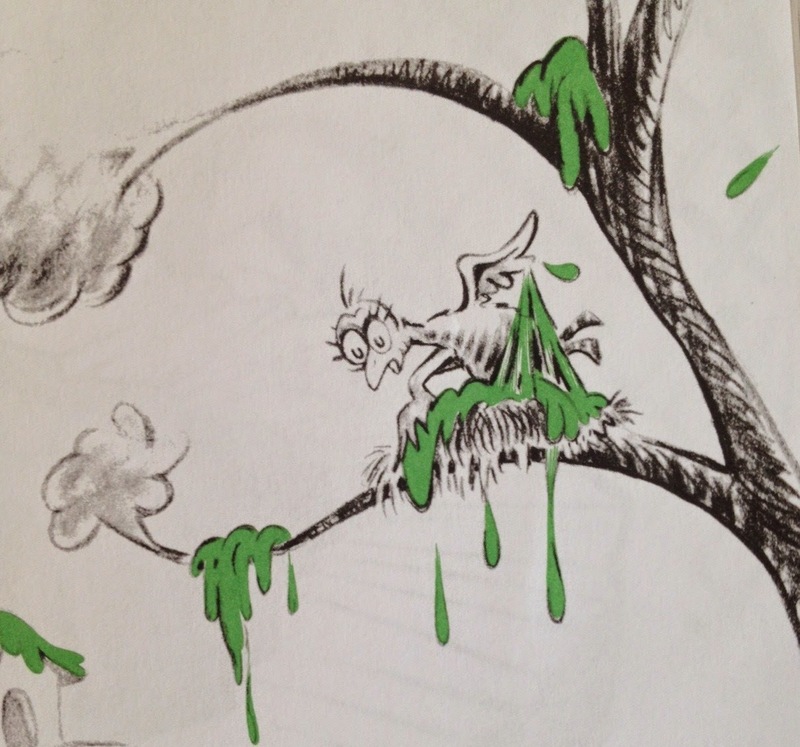 It's like in Dr Seuss's Bartholomew and the Oobleck - if green stuff started falling from the sky and settling on everything, you'd be a bit concerned, wouldn't you? Why should white stuff be any different? I expect that's why I'm being kind of pathetic and staying inside my cozy retreat writing stuff. Besides, the beautiful sunny days haven't arrived yet. So here is a vow: I vow that on Monday, I am going skiing, sun or no sun. No really. I guarantee that tomorrow evening, I will post a picture of a ski trail, right here on this blog. In the meantime, I'm going to take that strange disturbing feeling snow gives me and pour it back into some writing.